Doors open at 6:30 pm. Film begins at 7:00 pm. It’s a new year, which means it’s time for a whole new round of incredible free movies at Tribeca Cinemas – presented by The Korean Cultural Service. And to start off 2014… we’re going wild! Starting January 14th, join us for our new series, Wild Days – which showcases four brand new coming-of-age films (including Korea’s official submission to the Academy Awards), a cinematic foursome that varies between explosive, suspenseful, and downright sweet. While, on the surface, super-spies and troubled teens don’t seem to have that much in common, our new series is all about finding yourself and making the most of life – a concept that we think is the perfect way to kick off a new year! So bundle up this winter, gather your friends, and get ready for some of Korea’s finest new action, thrills, and drama – brought to you for free, as always, by The Korean Cultural Service NY! 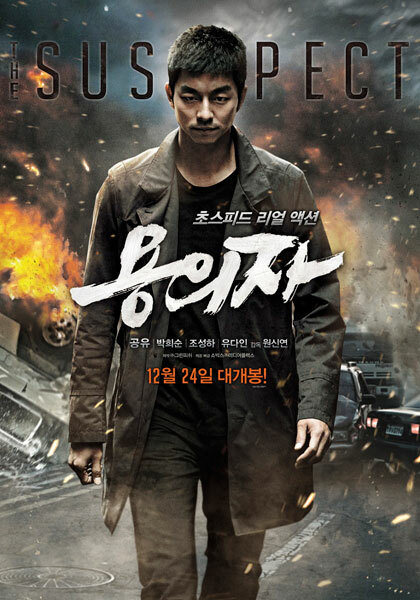 One of the hottest new action films from Korea, THE SUSPECT follows a North Korean spy (GONG Yoo), who is abandoned by his corrupt government and settles down in South Korea. Unfortunately for him, he becomes the prime suspect in the mysterious murder of a powerful CEO. The suspect, now hunted by a government that does not trust his innocence, has to uncover the truth and save himself before the clock runs out! The film will be shown in Korean with English subtitles. The next free Korean Movie Night screening will be of JUVENILE OFFENDER (2012, 117 min) on Tuesday, February 25th, 2014.